Unlike in the West where a mass-produced bag is haphazardly steeped in boiling water, tea in Asia is taken much more seriously. In fact, the history of Asian tea dates all the way back to the beginning of recorded history itself! Even the act of pouring tea in Asia has been refined into an art that takes years of discipline to perfect. Different varieties of tea are brewed at specific temperatures for exact amounts of time to achieve the perfect cup. The tea in Asia knows no limits. From meeting rooms in Tokyo skyscrapers to the smallest huts in remote Chinese villages, a steaming pot of tea is being prepared at any given time! As you travel throughout China and other countries, you'll often be offered a cup of tea for free. So who first decided to steep leaves from a random shrub and accidentally create a drink that is second only to water in consumption? Although credit is generally given to the border areas of East Asia, South Asia, and Southeast Asia—specifically the region where India, China, and Burma meet—no one is really sure who decided to steep the first tea leaves into water or why. The act possibly predates written history. Genetic studies of the camellia sinensis plant suggest that the first tea trees originated near North Burma and Yunnan, China. Regardless, all can agree on one thing: Tea is the most widely consumed beverage in the world. Yes, it even beats coffee and alcohol. The first written evidence of making Asian tea dates back to a Chinese work from 59 B.C. Historical evidence exists that tea later spread east to Korea, Japan, and India sometime during the Tang dynasty in ninth century. The techniques used to brew tea advanced over time, depending on the preference of the current dynasty. Although tea first began as a medicinal drank, it slowly evolved into a recreational beverage. Portuguese priests first carried tea from China to Europe during the 16th century. Tea consumption grew in England during the 17th century then really became a national passion in the 1800s. The British introduced tea growth in India in an attempt to circumvent the Chinese monopoly. As the British empire grew throughout the world, so did the worldwide love for tea consumption. China is unsurprisingly the world's top producer of tea; over a million tons are produced annually. India comes in a close second with revenues from tea providing a whopping 4 percent of their national income. India alone has over 14,000 sprawling tea estates; many are open for tours. Russia typically imports the most tea, followed by the United Kingdom. All varieties of tea come from parts of the same plant: Camellia sinensis. Turkey is the leading consumer of tea in the world per capita. Asians refer to black tea from the West as "red tea." Tea plants will continue to grow into trees up to 50 feet tall if not continuously pruned. A tea plant takes at least three years to produce leaves. You can't rush a good thing: slower growing plants produce tea with more body and flavor. Plants are often grown at higher elevations to slow growth. The smaller a tea leaf, the more expensive the tea. Workers are typically paid by the kilogram for bags of tea leaves, so they must pick many more leaves for the same payout. Tea tree oil, also called melaleuca, doesn't come from the same shrub that produces drinking tea. Tea tree oil is toxic if swallowed and comes from a shrub native to Australia. It's thought that Captain Cook steeped leaves from the shrub as a substitute for tea, hence the name. The Chinese have a fanatical love affair with tea. In fact, the formal tea ceremony is known as gong fu cha or literally the "kung fu of tea." From shops, hotels, and restaurants to public transportation stations, expect to receive cup after cup of green tea—usually for free! Outside of formal settings such as banquets, Chinese tea usually consists of a pinch of green tea leaves dropped directly into a cup of kai shwui (boiling water). Hot-water taps for preparing tea can be found on trains, in airports, receptions, and most public waiting areas. China has developed a wide variety of teas purported to have positive affects on health; however, Long Jing (Dragon Well) tea from Hangzhou is China's most celebrated green tea. Tea was brought to Japan from China during the ninth century by a traveling Buddhist monk. Japan integrated the act of preparing tea with Zen philosophy, creating the famous Japanese tea ceremony. Today, geisha train from an early age to perfect the art of making tea. Each meeting for tea is considered sacred (a concept known as ichi-go ichi-i) and meticulously follows tradition, adhering to the belief that no moment can ever be reproduced in its exactness. The art of using the making of tea to better oneself is known as teaism. Tea substitutes for alcohol as the social drink of choice in Southeast Asia's Islamic countries. Locals gather in Indian Muslim establishments known as mamak stalls to shout over soccer matches and enjoy teh tarik — a frothy mixture of tea and milk — glass after glass. Achieving the perfect texture for teh tarik requires pouring the tea theatrically through the air. Annual pouring competitions are held in Malaysia where the world's best artisans juggle tea through the air without spilling a drop! Tea has slightly less of a following in Thailand, Laos, and Cambodia. Perhaps the tropical climate makes hot drinks less appealing, although Vietnam is consistently one of the top tea producers in the world year after year. Travelers in Southeast Asia are often disappointed to find out that "tea" is a sugary, processed drink sold by 7-Eleven minimarts. In restaurants, tea is often an American-brand teabag provided with hot water. "Thai tea" is traditionally tea from Sri Lanka that is cut around 50 percent with sugar and condensed milk. 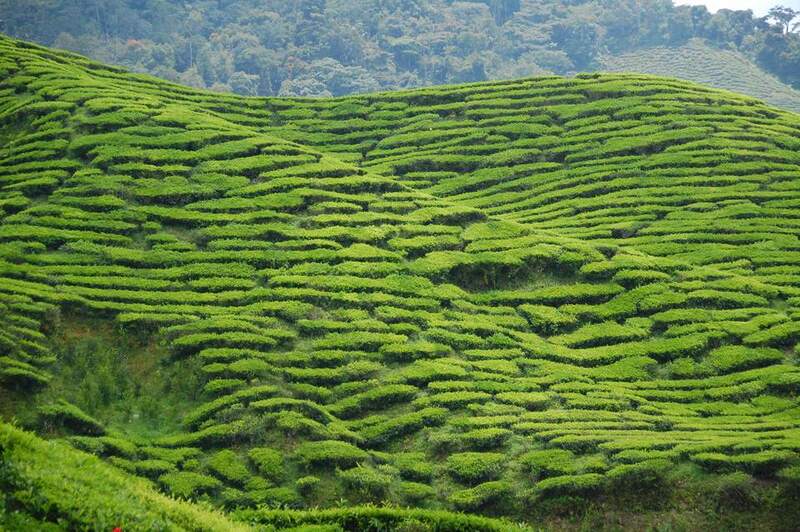 West Malaysia's Cameron Highlands are blessed with the perfect climate and elevation for growing tea. Verdant, sprawling tea plantations cling to hilly slopes as workers struggle beneath huge 60-pound bags of leaves. Many tea plantations near Tanah Rata in the Cameron Highlands offer free tours. Like so many of the consumables we enjoy, a lot of sweat and potential abuse were involved to get that tea from Asia into your cup. Tea workers in many places are severely underpaid, toiling long hours in rough conditions for just a few dollars per day. Child labor is also a problem. Workers are paid by the kilogram of tea picked. As you can imagine, it takes a lot of little leaves to equal any substantial amount of weight. The cheapest brands of tea often come from companies that profit from despair. Unless a tea is certified by a known fair trade organization (e.g., Rainforest Alliance, UTZ, and Fairtrade), you can rest assured that workers were most likely not paid a living wage for the region. The Indian government designated December 15 as International Tea Day in part to bring more attention to the plight of tea workers throughout the world.